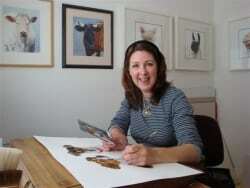 Contact Claire Stallard today to arrange your pet portrait. If you're looking to discuss a commission or purchase an existing piece from my gallery, contact Claire today on 01453 887776 or complete the enquiry form below. Don't forget, you can view my prices here, learn about commissioning a portrait here or read some FAQs here too.